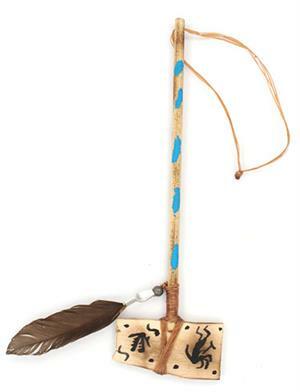 This small wooden tomahawk has a sinu string for hanging. It has a handpainted design with a feather off to the side. They measure between 9 1/2 to 11 1/4" long and are about 1 5/8" wide. Crafted by Navajo artisan Shirley Gibson Lee. Available with a kokopelli and native design, a turtle and native design or an all native design. Choose style(s) when ordering or let us choose for you.